The wedding we went to this past weekend isn’t really worth writing much about – it was a wedding and the married couple are very happy. The end. However, we did have a great time in Sooke when away from the wedding festivities. The B&B we stayed at had a hot tub right on the beach, we got lots of downtime to read in the sun and play guitar, and on Sunday we drove up the coast to visit the place where I broke my ankle five years ago. I’ve always wanted to go back there – though I had completely forgotten what a gorgeous part of the coast it is (I was a little preoccupied with endorphins and thoughts of rescue the last time around). 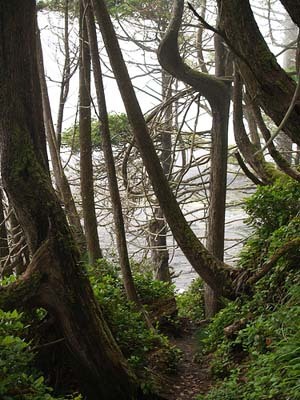 The Juan de Fuca Marine Trail has four or five access points along the road winding up the west coast of Vancouver Island – and this particular spot is accessed off the Parkinson Creek lot (found at the end of four kilometers of badly-potholed logging road the parks service seems to have stopped maintaining). From the trailhead to the beach is perhaps only 2 kilometers through secondgrowth forest which leads out to a beach covered in solid rock shelf and tidal pools. The day was misty, the waves were fierce, and yet the temperature was not too cold for exploring and picnicking. The only other people you are likely to run into at this amazing spot are through-hikers on the JFMT since the parking area is poorly marked from the highway and it’s not a popular spot for camping or surfing. I’ve posted some photos here. Including the panorama shot below. Click on that image to see it in a larger size. More soon. ← Not a good wife.